Costa Magna is a beautiful creation of Proteksan shipyard capable to cross the Oceans what she already did several times.Voluminous interiors spaces fitting 5 cabins welcoming up to 12 guests,, she is RInave Commercially coded and in Class Bureau Veritas. regulars refits these recents years to maintain her in nice condition. 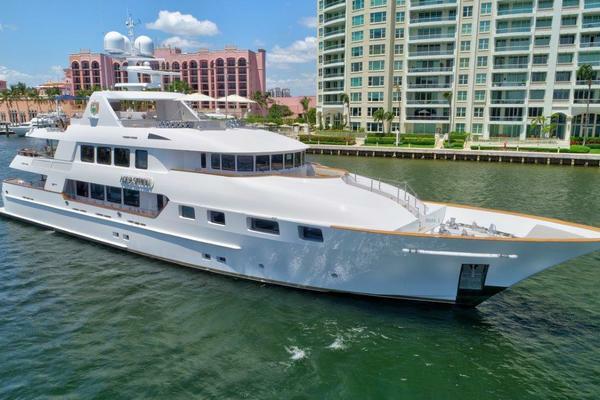 United Yacht Sales New Jersey would love to guide you through a personal showing of this 144' Proteksan 1983. This yacht for sale is located in Unknown Monaco and priced at $3,790,000. For a showing please contact us by filling out the form on this page and we will get back to you shortly! Fuel:90,055 litres / 23,780 US lLubrication oil:1,500 litres / 396 US Gal.Dirty lube oil:1,000 litres / 264 US Gal.Fresh water:20,014 litres / 5,285 US Gal.Grey & black water:2,000 litres / 528 US Gal. 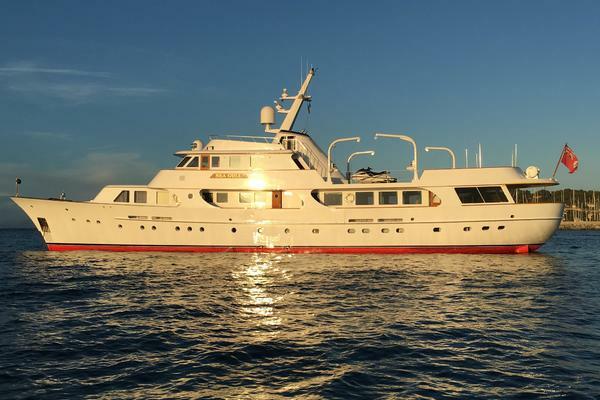 10 / 12 guests in 5 cabins, 4 ensuite bathroomsMAIN DECKThe large OWNER’S SUITE is forward on the main deck. The foremost part occupies the full width OWNER’S BATHROOM finished in rose pink marble. The bathroom has access through doors on the port and starboard sides. Amidships is a large marble bath. On the starboard side of the bath is a bidet and a washbasin. On the port side are the toilet and a washbasin. Next is the centrally positioned king size bed with bedside tables on either side. On the port side of this stateroom is a sofa. Further aft is the OWNER’S STUDY. To starboard is a desk and executive chair. Opposite is a sofa and chair and a coffee table. This cabin has ample locker and hanging space.On the starboard side of the aft bulkhead is a door giving private access to the on-deck bathroom with a head and washbasin (access for guest is from the passage way running down the starboard side).Access to the owner’s quarters if from this starboard side passageway. Here is access up to the wheelhouse and down to the guest quarters.Amidships, through a door from the passageway, is the L-shaped GALLEY and PANTRY AREA. Forward to port are the stairs leading down to the crew’s quarters.Aft is the DINING ROOM with a large round table for ten guest. and the MAIN SALOON which has an intimate central seating area with two sofas facing each other. There are two sliding doors leading from the saloon to the large AFT DECK.LOWER DECKFrom forward is the CREW AREA with to port an UPPER and LOWER BERTH CABIN and to starboard an UPPER and LOWER BERTH CABIN with a bathroom ensuite including a shower, head and washbasin. Aft to port is a bathroom with a shower, head and double wash basin. Aft to port is a TRIPLE BERTH CABIN. The CREW MESS has a dining table with a U-shaped settee. There is a video library with a television and video recorder. In the starboard corner is an electric Miele 4-burner ring stove and double stainless sink. Along the aft bulkhead are large refrigerator and deepfreeze storage. Aft to port of the crew mess is the LAUNDRY AREA. Aft (through a watertight door) is a walk-in COLD DRY STORE. Aft to port is a bathroom with a head. Aft of this is a TWIN CABIN with upper and lower berths. Then there is the stairway for the crew access to the main deck. There is an emergency crew exit from the forward crew cabin.Aft, through a door, is the crew service access to the lower deck GUEST ACCOMMODATION. To starboard is a DOUBLE BEDDED CABIN with a bathroom ensuite including a bath with a telephone type shower, a double sink and an adjoining head and bidet area. The cabin is equipped with a radio cassette and an internal phone. There are hanging lockers and drawers. Aft to port is a small TWIN BEDDED CABIN, which has two berths, installed, one athwart ships and one the length of the vessel. Aft to starboard is a DOUBLE BEDDED CABIN with a bathroom ensuite with a bath, a double sink, adjoining bidet and head area. This cabin has a sofa, radio cassette player and internal phone. There are hanging lockers and drawer space. Aft to port is a TWIN BEDDED CABIN with a bathroom ensuite with a shower stall, a double sink and adjoining head and bidet area. The cabin is equipped with a radio cassette player and an internal phone. There are hanging lockers and drawer space. There are storage cupboards in the hallway.From the engine room there is a possibility of access to the GARAGE with a lift to aft deck (not in use presently). Access is through the hinged aft bulwarks and ramp to the shore.UPPER DECK/SKY LOUNGEForward the wheelhouse is L-shaped with the radio room area on the port side and the entrance to the CAPTAIN’S CABIN on the starboard side. The captain’s cabin has a single bed that can be opened to form a double bed. There is a desk and an ensuite bathroom with a shower, head and washbasin.From the radio room area is a door leading to a short passageway from which is access to a DAY POWDER ROOM and to the SKY BAR. This has a L-shaped seating to port and to starboard and a bar with a stainless steel sink and an Electrolux frigo bar with icemaker. Double sliding doors lead onto the UPPER DECK with a large dining table and 2 additional dining/coffee tables with banquette seating. The JACUZZI DECK is adjacent and has a spa Jacuzzi with banquette seats on either side. There is teak decking throughout.Up from a corridor is access to the FLYBRIDGE AREA, which is teaked. There is a steering consul amidships with a bench seat with duplicate controls. An extension was constructed in 1999 to give a total of 60 m². There is a bimini top over the fly bridge. COSTA MAGNA was built and is currently, to RINAVE Commercially Registered. 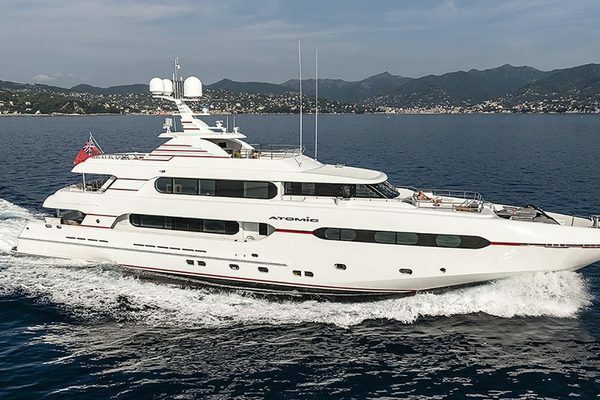 She has a proven record of cruising extensively in the Atlantic, Indian and Pacific Oceans.There was a total renovation of main saloon and master cabin, including carpeting throughout guest areas, bar, passageways and bridge in 1998, 2006 and 2013. The new interior includes mahogany wood furniture, hand woven carpets, and lacquered panels with mahogany insets.The refit in 1999/2000 included:Two new cranes (Cramm) and two new tenders (Novamarine)New teak decking on the wheelhouse deck New sundeck areaNew seating on aft deckFly bridge extension giving a total of 60sq meters Superstructure paintedInstallation Sea-Tel satellite systemThe refit in 2001/2002 included: sandblasting of under water hullApplication of new antifoulingInstallation of new grey water tank and respective pipe workInstallation of new cathodic systemNew tail shafts and stern tube glandsNew teak decking on the foredeck and on the fly bridge deckGeneral maintenance of main engines and generators Build-up coat of antifoulingPainting with Awlgrip paint system by Pinmar.The refit in 2003/2004 included:sandblasting of under water hullApplication of new antifoulingInstallation of new grey water tank and respective pipe workInstallation of new cathodic systemNew tail shafts and stern tube glandsNew teak decking on the foredeck and on the fly bridge deckGeneral maintenance of main engines and generators Build-up coat of antifoulingPainting with Awlgrip paint system by Pinmar.Installed new sewage system (Hamman plant) Installed new bow thrusterInstalled new air conditioning system (Heinen & Hopman)Installed new fridges compressorInstalled new stabilizers (Koop Nautic)Built a swimming platform including a swimming ladderBuilt hydraulic gangwayComplete overhaul of the 2 main enginesComplete overhaul of the 2 generatorsGalvanized the chains and anchorsReplacement of seawater manifold after sea chests and all the valves on that manifold.Alignment of the 2 propeller shaftsReplacement of the 2 propeller shaftsChanged the 2 boilersRepaint the inside of the fresh water tankChange of the deck plate in the floor salon (aft part) Built a bow storage2 Yamaha wave runners2 Novamarine FH 450 170hp (2005)Installed a new hydraulic rudder plantThickness measurement of the hull (under water line area) and replacement of the weak area.Re-caulking of the decksReplacement of the deck in the following area: upper deck, 2 corridors, main deck, aft deck. Replacement included teak, lamination, and inspection of the deck plates.Replacement of the ceiling (including electric wires) of the 4 outside corridorsChange all the appliances of the galley (stove, oven, fridge)Enlargement of the bed in the master cabin.Painting of the hull (topsides).The 2006 refit included:New carpets throughout main deck and Owner’s area New wooden blinds installed main deck and sky lounge All new upholstery in the sky loungeNew upholstery in the dining roomNew interior design of the main salon to the last detailsOwner’s cabin has all new fabrics and interior design New carpets in Sky Lounge/barThe 2011 refit included:Addition of numerous safety equipment to comply with new licence to carry 45 passengers.Superstructure repainted.New teak on upper deckInstallation of Jacuzzi and adjacent lounging area. New crane installed on bow.Tenders relocated to bow.Modification/silencing of generator exhaust systems. New cushion covers on Flybridge.New covers/decoration on upper deck.The 2013 refit included: New carpeting throughoutNew soft furnishings in SaloonFull Awlgrip Painting hull and superstructure Television installed on Jacuzzi deckThe 2015 Refit included:Hardwood floors installed on main deck corridor, stairs leading to bridge/bar, as well as bar, cooridor, bridge and office.